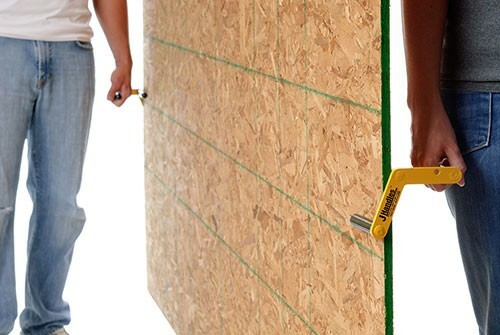 If you have ever had to move sheets of plywood or drywall, you know it is not the easiest thing to do. Manly men might say they can do it by themselves, but what happens when they need to go through a doorway? Too tall to fit, huh? JHandles thinks their product offers a better way to move sheet goods—but are you manly enough to give it a try? 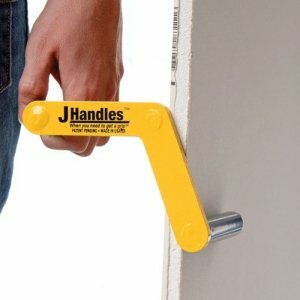 JHandles come in sets of two and allow two people to carry sheet goods in a position that is more natural and more comfortable for the user. Their simple metal doohickey with three metal peg-like thingamajigs works in a way that uses the weight of the object to self-clamp between the pegs of the JHandle. The pegs are coated so they don't slip and they work for both righties and lefties.